Lucy is recognized as one of the best negotiators in the Victoria area - resulting in a network of loyal clients who use her services over and over again. This Mandarin Chinese & English speaking realtor is a fountain of experience, competence and energy - in helping you buy or sell houses, condos in Victoria. 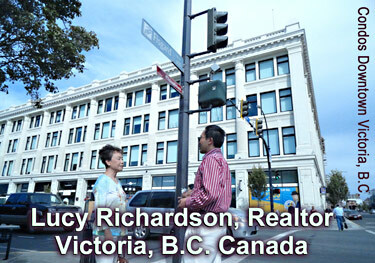 Lucy Richardson is a recognized award winning top performing MLS realtor in Victoria since 1997. for your real estate selling and/or buying needs. "Here on the southern tip of Vancouver Island, Victorians are blessed with a beautiful city, a magnificent setting and a climate that is the envy of the rest of Canada. It's not surprising that so many people have come here to settle, retire and make Victoria their home. Moving to Vancouver? Looking for a realtor / real estate services in Vancouver, BC? see also MetroTown.info Vancouver realtors section. resources on rentals, real estate, neighborhoods etc. In light of the "leaky condo crises" in BC and the major and numerous lawsuits and heartaches arising from this era of poor building quality control, it is prudent for buyers of condos to be wary. Please note: the Victoria law firm of Acheson & Co. initiated one of the first successful class action real estate lawsuits involving what has become known as the BC leaky condo crisis in the 1990's see their web site at www.achesonco.com for the whole range of legal services this firm provides. Real Estate Division, University of British Columbia "... provides practice-oriented, part-time continuing education courses in real estate" see their web site at www.realestate.ubc.ca for more information. Barrister & Solicitor's practice in real estate services eg. conveyancing. Charlotte areas of practise includes: Residential Real Estate Conveyancing · Wills & Estates Planning · Civil Litigation, including personal injury (e.g. ICBC claims), civil actions in sexual assault cases, & commercial litigation. Charlotte has a previous background in real estate development and corporate commercial financing. In June 2012, she was appointed by a BC Legislature Order in Council to the board of directors of the British Columbia Assessment Authority www.bcassessment.ca. Please note: the Victoria law firm of Acheson & Co. initiated one of the first successful class action real estate lawsuits involving what has become known as the BC leaky condo crisis see their web site at www.achesonco.com for the whole range of legal services this firm provides. 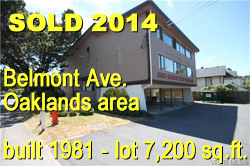 see the information web site of Vancouver business & Canada immigration lawyers CanadaVisaLaw.com Lowe & Co.
House at: 3166 Wascana St., SW Tillicum, $369,000, 2 bedrooms, 1 bath, built 1954, finished sq.ft.850, lot 5,750 sq. ft.
House SOLD at: Nicklaus Dr., La Bear Mountain, 6 bedrooms, 6 baths, build 2013, finished sq.ft. 4,938, lot sq.ft.8,712, lot shape irreg. 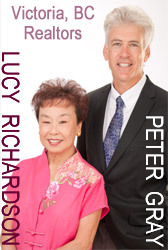 Lucy Richardson, a Chinese-English speaking realtor is a fountain of experience, competence and energy - in helping you buy or sell houses, condos, as well as select downtown commercial/residential properties in Victoria.